After adoption of SharePoint or Office 365, one of the first things an organization will look for is some understanding as to how the product is being adopted, and what its impact on resource allocation is. Historically, options for reporting on SharePoint have been limited at best. The Web Analytics Service application was introduced with SharePoint 2010, and relied on a series of connected Excel workbooks and a fairly Byzantine series of staging and reporting databases. It worked so well that it was removed from the product in SharePoint 2013. The Usage logs contain a rich set of information, and they are rolled up into the Usage database, but accessing the data or persisting it beyond a short time period required a fair bit of work. There were also third party analytical solutions, but most of these came with a hefty price tag, and they focused on page views, embedding code on a page. This approach works well enough for web pages, but it doesn’t capture everything, for example document access though the .NET API. They’re therefore not always well suited to collaborative environments. SharePoint in Office 365 was initially devoid of analytics, but some basic reports have been creeping in in recent months. With the new administration portal going live, these reports moved from the relative obscurity of the compliance center to the brand new report center, and were augmented by some additional reports. With the release of SharePoint 2016, and the announcements made at the Future of SharePoint Event on May 4 2016, we can see the additional areas where analytics are being introduced into the core product. At this point, it’s a good idea to step back and have a look at the Analytics landscape as it pertains to SharePoint and Office 365. At the moment, the analytics offerings can be grouped into 4 major categories; tenant scoped, site scoped, document scoped, and Delve Analytics. Let’s have a look at each one in turn. The tenant scoped reports are the aforementioned reports that are now available in the new Office 365 Reporting Center. There are a number of interesting reports in here that focus primarily on the tenant as a whole. How much OneDrive space users are using, Yammer message counts, Skype meetings, emails sent and received, etc. In addition, these reports can be interacted with to show four different time periods, 7, 30, 90, and 180 days. Year over year analysis is not available. These reports will primarily interest administrators, and it therefore makes sense that they are only available in the administration center, where administrative permissions are required to access them. Site scoped analytics contain data that is of concern to site administrators. These users are more concerned with content usage than resource allocation. These analytics features were initially announced at the Future of SharePoint event on May 4 2016, and as of this writing, have not yet rolled out. This is welcome data to beleaguered site administrators, and it will help to identify important content, and content that maybe could be pruned. While it will be initially rolling out to SharePoint Online, the good new is that on premises users will also be able to get this through the new Analytics service application. In a similar model to the new hybrid search, the new Analytics service application called SharePoint Insights connects to Office 365 and delivers your on premises usage data to the service – essentially everything that is kept in the logging database. From there, the service can act on it to do interesting thing. One of those interesting things will be to deliver content based activity reports like the ones seen above. There are a few things to take note of about site scoped analytics. They are scoped to the site, not the site collection. They do not roll up into a master report, so each site must be visited in turn (they live in the “site contents” section) to see the results. As far as I’m aware, the data is only persisted for a short time (I have only seen 7 days), so time based analysis is not possible. Document scoped analytics have been in the service for some time now, and the new document library exposes them. I call them analytics, but they really are just the activity stream for a document or a folder. The do offer insight, so we’ll stick with the term. From a “new style document library, you select the information icon on the right to open up the information pane. Part of that information is the activity stream of the document. In the example below I have selected a folder. Delve Analytics is a new offering from the Office team that focuses on the user. It analyzes a persons communications and schedule to provide insights into their work experience, with measures like time spent in meetings, time spent in email, work life balance, etc. Delve analytics doesn’t really belong in a blog post about SharePoint because it doesn’t analyze any SharePoint or OneDrive data, so I’ll keep this section short. For the moment at least, it is restricted to Exchange email data as a source. Delve Analytics requires an Office 365 E5 license or it can be purchased separately. Unlike the rest of the analytics options here, there is an extra cost associated with it. The analytics options available in Office 365 and in SharePoint have improved drastically, but are still in their infancy. Each of the approaches are targeted at different audiences (IT Pro, site admins, content authors, individuals). This approach is bot good and bad. Tailoring an approach to an audience means that the specific audience will be satisfied, but the different approaches can become somewhat disjointed. It depends on what is necessary. Analytics at the moment are also limited to specific time slices, if time can be sliced at all and to specific dimensions/measures. This is no problem if recent activity is the only thing of interest, but if more fine grained time slices or year-over-year analyses are needed, then the out of the box approaches will fall short. Finally, most of the reports focus on activity, there is very little information provided about the SharePoint or Office 365 inventory. The good news in all of this is not only that Microsoft has made analytics a priority, but that all of its features in this area use publicly available APIs. this means that there is plenty of room for third party vendors to step in to fill gaps and to provide complete analytics focused solutions. In that vein, I’m very proud to announce that my company, UnlimitedViz will soon be releasing a product, tyGraph for Office 365 to do exactly that. 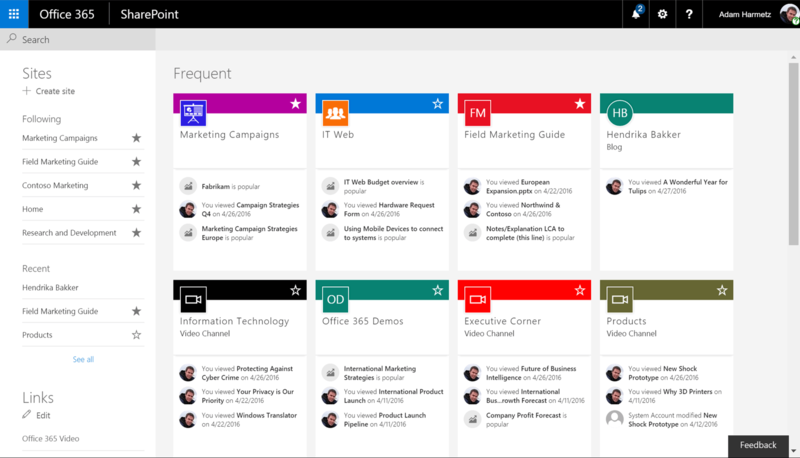 This entry was posted in Business Intelligence, Office 365, SharePoint, Technology and tagged Analytics, FutureOfSharePoint, Office365, Reports, tyGraph on May 4, 2016 by John White. I recently participated in an online webcast panel discussion on the impact of cloud computing on IT. This has just been posted as an on demand webcast, and if you’re interested, you can watch it here. On the surface, cloud computing would seem a threat if you’re involved in infrastructure. However, my take on this is that it’s an opportunity for IT folks to focus less on “plumbing” related things, and more on things that will drive true business value, making themselves that much more important to the organization. The reality is that IT services are constantly being commoditized. Networking used to be a big deal, and now it’s taken for granted. Ray Noorda (the founder of Novell) once said “where there’s mystery, there’s margin”. It’s too bad that his company didn’t keep chasing the mysterious – they were recently acquired by Attachmate. Cloud computing is coming to your business, in one form or another. At the very least, if you’re in IT, you want to figure out how you’re going to deal with it. You can get on the bus,get out of the way,but if you just stand there like a deer in the headlights, you’ll get run over. This entry was posted in Cloud Computing, Technology and tagged BPOS, cloud computing, Office365 on December 10, 2010 by John White.